Indiana State Road 156 begins at an intersection with Indiana State Road 56 in Vevay, Indiana and ends at an intersection with Indiana State Road 56 in Ohio County. Indiana State Road 156 traverses Switzerland and Ohio County along the Ohio River. Indiana State Road 156 enters Ohio County about 8.35 miles from its intersection with Indiana State Road 250 in Patriot Indiana in Switzerland County. It ends about 1.35 miles north at an intersection with Indiana State Road 156 is part of the Ohio River Scenic Byway in Ohio County. Indiana State Road 156 begins at an intersection with Indiana State Road 56 in Vevay, Indiana, where it is Main Street. As the highway wends its way east it forms a leg of the Ohio River Scenic Byway in Switzerland County. It passes the Markland Dam and Locks. An intersection with Indiana State Road 101 which crosses a bridge across the Ohio River, connects with US Route 42 in Kentucky. It passes the Beltara Golf Club and the Beltara Casino just west of Florence, Indiana. 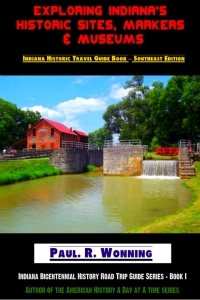 After passing through some beautiful southern Indiana countryside and the Bryant's Creek Public Access Site on the north, then west and the Ohio River on the right Indiana State Road 156 passes through Patriot, Indiana. About 8.5 miles after leaving Patriot, it crosses into Ohio County.